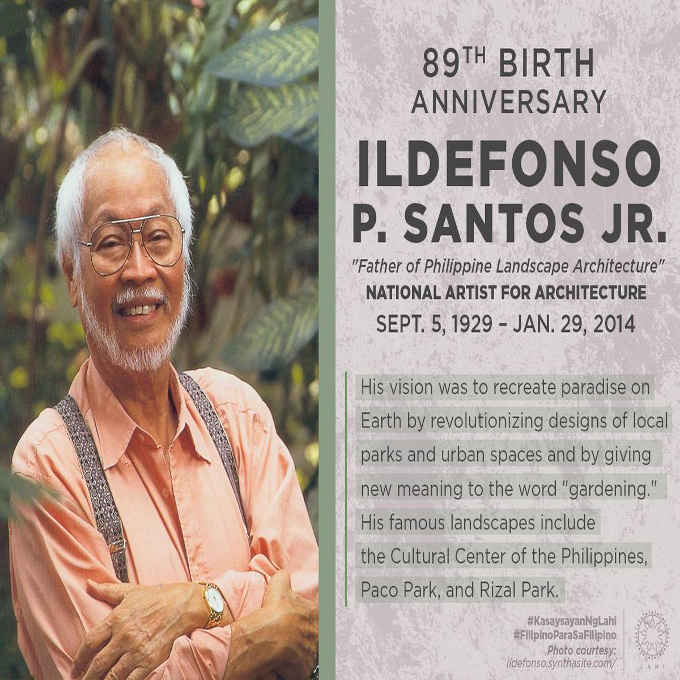 The Father of Philippine Landscape Architecture is Ildefonso P. Santos Jr. He is a Philippine National Artist for Architecture. He was born on September 5, 1929 and passed away on January 29, 2014. His vision to recreate paradise on earth by revolutionizing design of local parks and urban spaces and by giving new meaning to the word “gardening”. His famous landscapes include the Cultural Center of the Philippines, Paco Park, and Rizal Park. Santos (Father of Philippine Landscape Architecture) who pioneered the landscape architectural profession in the Philippines, is well-known in professional circles for his uncompromising integrity and high degree of professionalism. He was instrumental in the establishment of the specialty board of landscape architecture at the professional regulation commission (PRC) of the Philippines. He holds PRC registration no. 0000001. He attended the University of Santo Tomas, where he received bachelor of science degree in architecture in 1954. Not content with his newly acquired degree, he aspired to enrich his architectural background by enrolling at the prestigious university of southern California school of architecture, los angeles, California where he obtained his second bachelor of architecture degree and his industrial design degree in 1956 and later, a master of architecture degree in 1960. The landscape architectural firm of Ildefonso P. Santos + Associates is one of the pioneers in the field of landscape architecture in the Philippines. Founded in 1963, the firm has worked on varied projects ranging from simple residences to sophisticated and complex developments such as resorts, memorial parks, shopping centers, hotel, office buildings, schools, subdivisions, high-rise condominiums, parks playgrounds, sports clubs, shopping malls, etc., and into the field of environmental planning and protection, employing innovative and imaginative design and planning concepts.